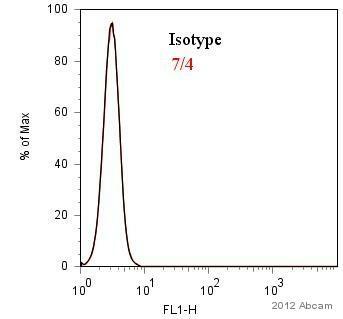 Rat anti mouse Ly-6B.2, clone 7/4 recognizes the Ly-6B.2 antigen in 129J; AKR; C57BL/6; C57BL/10; C58; DBA/2; NZB; NZW; SJL; MFI; Swiss (PO) strains. A2G; A/Sn; ASW; BALB/c; C3H/HEH: CBA.T6T6 are negative or demonstrate very weak reactivity. Tissue/ cell preparation: cultured bone marrow cells. Flow Cyt. : New Zealand Black mouse peripheral blood granulocytes. ab53453 recognizes the Ly-6B.2 antigen. 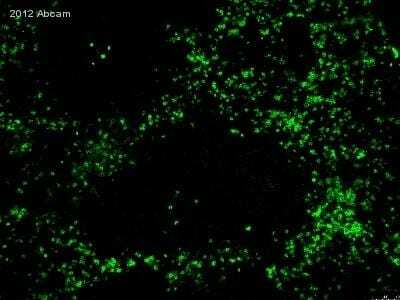 Ly-6B.2 is a ~25-30 kDa GPI-anchored, heavily glycosylated protein expressed on neutrophils, inflammatory monocytes and some activated macrophages. High levels of expression are seen in bone marrow, spleen, lung and lymph nodes. N-glycanase treatment of thioglycollate elicited peritoneal neutrophil lysates lowers the apparent molecular weight of Ly-6B.2 to ~15 kDa. ab53453 has been successfully used for the immunomagnetic depletion of neutrophils during the enrichment of primitive hematopoietic cells from bone marrow and the depletion of myeloid cells in vivo. 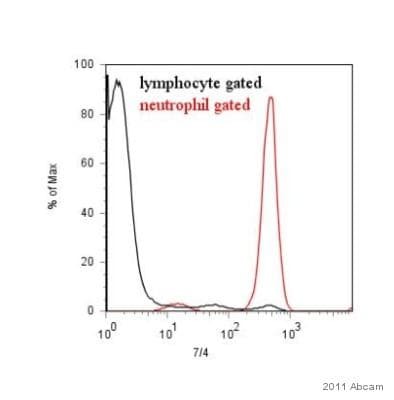 ab53453 recognises a neutrophil allotypic marker, a polymorphic 40kD antigen expressed by polymorphonuclear cells, but absent on resident tissue macrophages. Our Abpromise guarantee covers the use of ab53453 in the following tested applications. 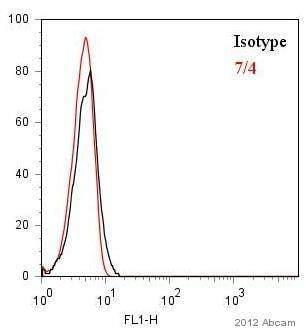 Use 10µl of the working dilution to label 106 cells in 100µl. Staining of New Zealand Black mouse peripheral blood granulocytes with Rat anti mouse neutrophil:FITC (ab53453). Immunohistochemical analysis of mouse spleen cryosection tissue stained for Neutrophil using ab53453. Immunohistochemistry (Frozen sections) - Anti-Neutrophil antibody [7/4] (FITC) (ab53453)Image is courtesy of an anonymous Abreview. 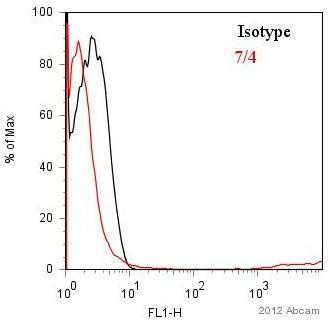 Immunohistochemical analysis of acetone-fixed frozen mouse spleen, labelling Neutrophil with ab53453 at a dilution of 1/100 incubated for 1 hour at 25°C in 5% goat serum in TBS. The secondary used (to amplify the signal) was a Goat anti-rat polyclonal Alexa Fluor® 488 conjugate at a 1/400 dilution. Publishing research using ab53453? Please let us know so that we can cite the reference in this datasheet. What is the meaning of Swiss (PO) in the listed species on the datasheet? Swiss PO is used to denote "Swiss-Pathology Oxford," a specific strain at Oxford University. Thank you for your enquiry. I am pleased to confirm the following information: ab105157 Datasheet suggests 10 ul per test 50 tests = 500 ul ab53453 On the datasheet, provide 50 ug at 0.1 mg/ml = 500ul I hope this will be helpful to you. If you have any further questions, please do not hesitate to contact us. Thank you for contacting us. Please check the following catalogue number; ab53457 ab53453 ab105157 ab2557 These are exact match to your requirements however I would recommend reading the datasheets carefully and buying the one as per your requirements. I hope this information is helpful to you. Please do not hesitate to contact us if you need any more advice or information.